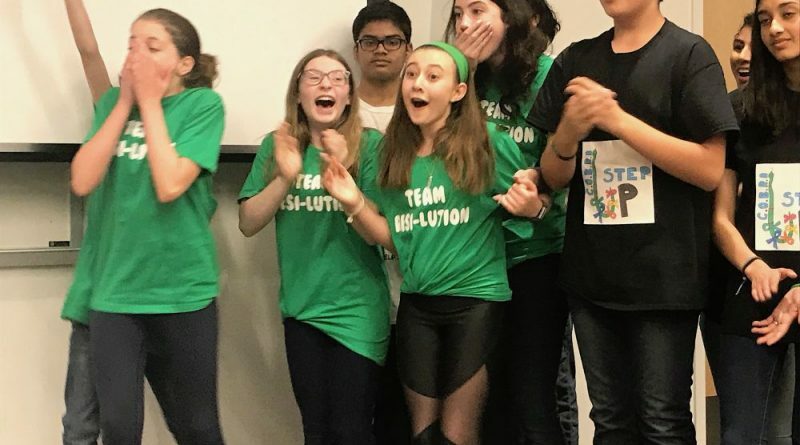 Members of Team Resi-lution react to the announcement of their top prize win during the 2019 Loudoun Youth Inc. Step Up competition. The group is leading community efforts to keep the parkland around the Beaverdam Creek Reservoir litter-free. 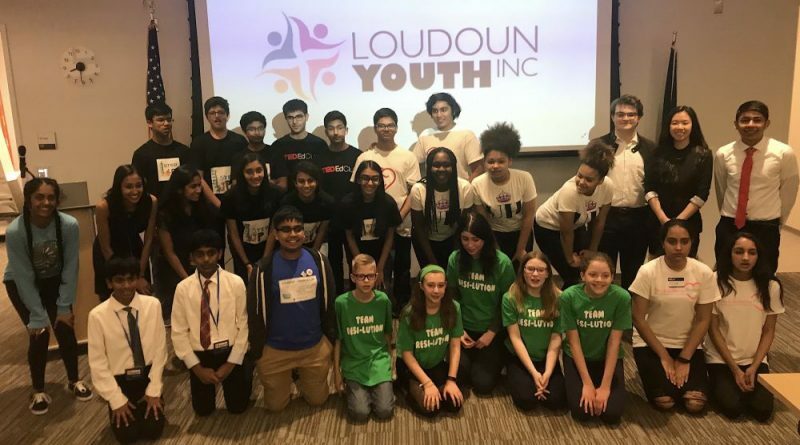 Dozens of students working to solve challenging community problems pitched their ideas to a panel of judges April 11 as part of Loudoun Youth Inc.’s annual Step Up competition. This year’s winning projects will help control litter at the Beaverdam Reservoir as it reopens for public activities this summer, allow retailers to put their online merchandise returns to use for charities, and help get Girl Scouts more involved in STEM education. The three top prize winners were selected from among 10 finalists who made presentations at the Brambleton Library. Those top 10 had advanced from a March 28 event that included 65 teams and more than 200 students. In the end, two teams tied for the top prize and each walked away with $1,000 cash prizes. Resi-lution is a team of Brambleton-area students who are organizing year-round litter cleanups around the 1,000-acre park. Owned by Loudoun Water, which has drained the reservoir during repair work, the property is expected to reopen to public access this summer under management by NOVA Parks. The students formed the Friends of Beaverdam Creek Reservoir and are raising money to build a storage shed for clean-up equipment through a Go Fund Me page. Also, they are organizing a Trash-a-Thon clean-up at the lake starting a 9 a.m. May 5 and hope to get businesses and community organizations involved through the Adopt-A-Trail and Adopt-a-Stream programs. Lacey Tanner, a senior at Rock Ridge High School, launched the effort as part of the 2017 Step Up program, and is passing on the program to four Brambleton Middle School students: Carter Casagrande, Annabelle Monte, Ava Turicchi and Joe Waxvik. iloom-Returns to Work also won a top prize. The team is comprised of Shreya Arun, Sahana Arumani, Abhinav Babu, Pranav Babu, Aarya Arun, and Amrit Neel Kumar. The nonprofit was formed after learning from a family friend about the difficulties that companies face when online purchases are returned by the buyers. Typically, the returned merchandise can only be resold at great discounts, but adds to a businesses’ inventory management and storage challenges. Under their program, businesses can direct their returns to an iloom chapter, which will donate the items to charity or sell the items and donate the proceeds to charity. Threadmill Home Linen is the team’s first supply partner and additional chapters have been established in Michigan, New Jersey and California. Learn more at iloom.org. This year’s third-place winner was STEM for Scouts, created by students from the Academy of Engineering and Technology to get girls more involved in STEM education. The team created programs for STEM Camps and coding classes that can be taught to troops. 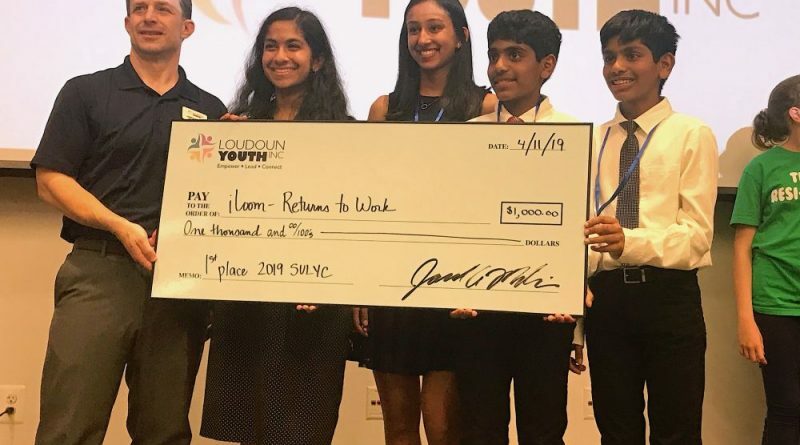 The Step Up Loudoun Youth Competition encourages middle and high school youth across the county to identify an issue in their school, neighborhood or community, create a plan to address that issue, and implement the plan. The goal is to encourage, support and reward the youth of Loudoun County for making positive changes in their own lives and the lives of others. Learn more at loudounyouth.org. iloom was a top prize winner in Loudoun Youth Inc.’s 2019 Step Up competition. The nonprofit accepts returns from online purchases to help area charities. 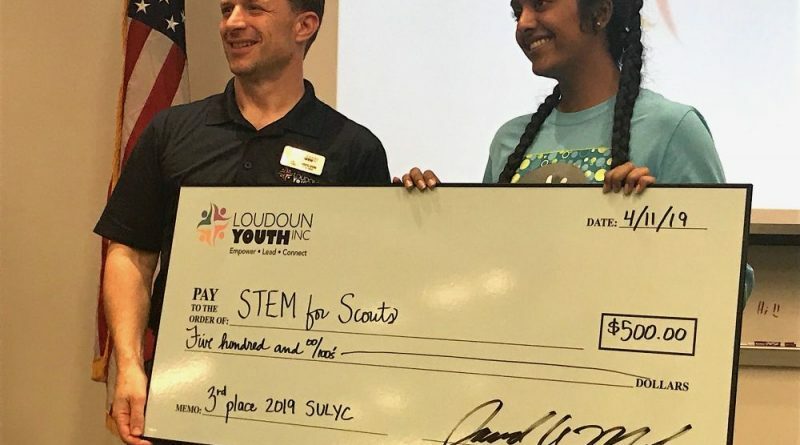 Stem for Scouts was a third place winner in the 2019 Loudoun Youth Inc. Step Up competition. The program introduces STEM classes and coding exercises to Girl Scout troops. Loudoun Youth Inc.’s 2019 Step Up competition finalists pose for a photo following a night of judging their presentations at the Brambleton Library. 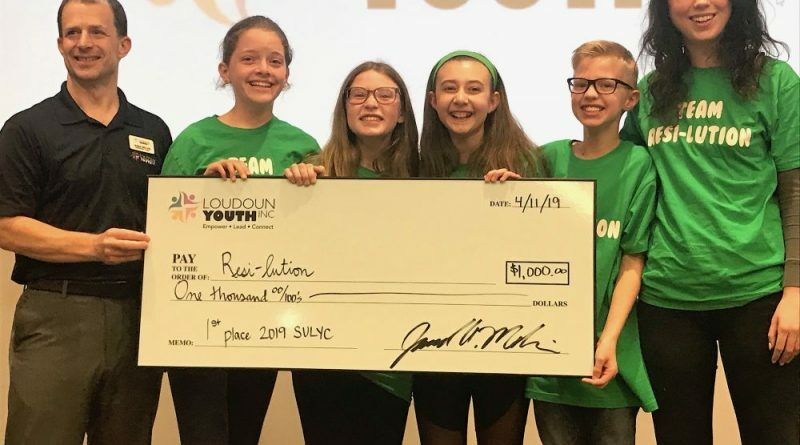 Members of Team Resi-lution won a top prize win during the 2019 Loudoun Youth Inc. Step Up competition. The group is leading community efforts to keep the parkland around the Beaverdam Creek Reservoir litter-free. 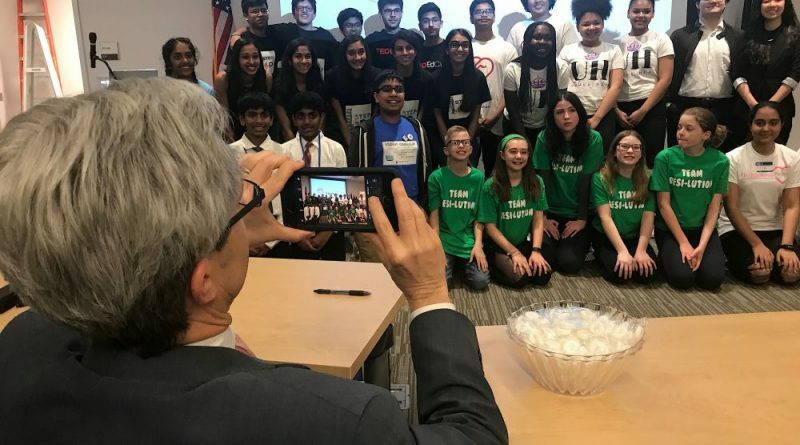 Loudoun Public Schools Superintendent Eric Williams shoots a photo of the Loudoun Youth Inc.’s 2019 Step Up competition finalists following a night of judging their presentations at the Brambleton Library.